The 1.0-litre 70 feels quite pedestrian by the standards of the class, particularly below 2500rpm, and you have to keep the revs up to avoid stalling when you pull away. However, once you get used to it, the engine is fine for town use, but on faster roads its lack of power makes keeping up with traffic hard work, and overtaking tricky. The addition of a turbo to the slightly smaller 0.9-litre 90 makes it much sprightlier. It picks up smartly from low revs and has a wide spread of power. If you venture out of town, and to open roads and motorways, it has enough punch to get up to speed and cruise at a steady 70mph with ease, making it the one we recommend. For something sportier there’s the Brabus version. This uses the same 0.9-litre engine, but boosted to 107bhp. While acceleration is brisker, it’s far from quick, so we’d recommend going for a Mini Cooper instead. Opt for the 80bhp electric model and it offers smooth, zippy acceleration off the line, which is very useful around town – although it doesn’t feel quite so urgent as the acceleration you get in the smaller Fortwo. Once past 40mph it doesn’t build speed with the same conviction but it’ll happily sit at 70mph without fuss. Prime and Passion trims come with 15in wheels and standard suspension, the most comfortable package for a Forfour. Even then, compared with the well-controlled ride in a VW Up, the Smart fidgets too much over patchy surfaces, and is quite bouncy across a series of dips and crests. We’d suggest you avoid the sports suspension and larger 16in wheels supplied with Proxy trim. While the firmer settings produce slightly better body control, the suspension’s extra stiffness means the car thumps and crashes over speed bumps and large potholes. The same is true of the even more stiffly sprung Brabus version. The electric version might get stiffer springs as well, but the additional weight of the batteries helps offset this. While it still bobbles around over urban ruts, it doesn’t get quite as upset as the petrol versions and is one of the most comfortable variants in the range. 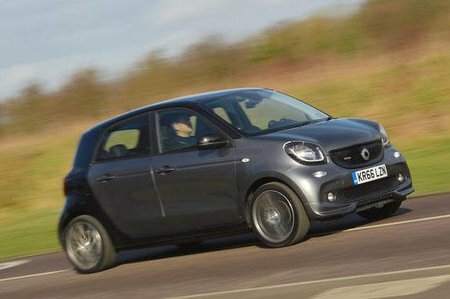 The Smart Forfour’s 8.7m turning circle is over a metre tighter than the VW Up’s. This, and the fact that the steering is really light, means that it can perform U-turns like a London cab, and doesn’t require much effort to park in tight spaces. The downside is that it needs a lot of turns to go from lock-to-lock, so you have to do a fair amount of arm twirling to get around tight bends. It also provides a lot less feedback on faster roads than, for example, a VW Up’s steering. 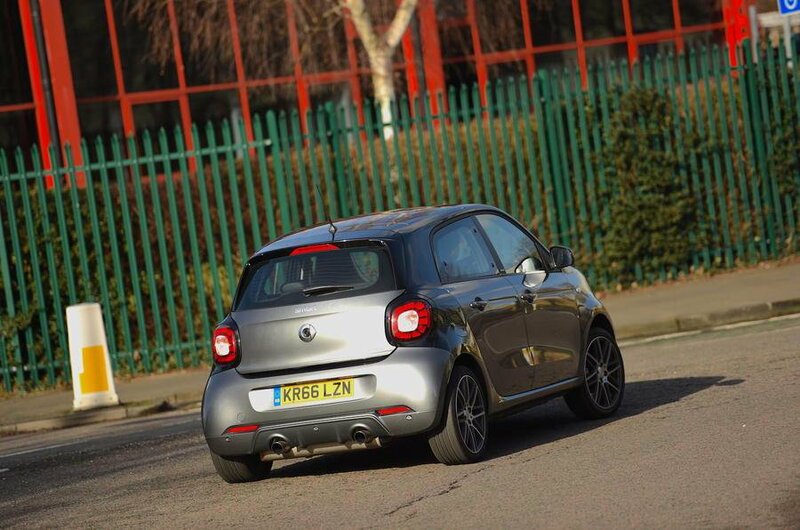 On the standard suspension the Smart suffers from a bit of body roll in corners, while the fact that the engine’s located in the back of the car makes it feel less grippy at the front than its rivals. There’s a Crosswind Assist system fitted as standard but even so, the Hyundai i10 or Up feel more stable at speed as the Forfour gets blown around in gusty conditions. The sports suspension reduces much of the Forfour’s body roll and improves stability but even so, it’s nowhere near as fun to drive as the Up. Likewise the Brabus model. It might claim to have hot-hatch credentials, but a Mini Cooper and Fiesta ST are leagues better in the bends. The handling is better on electric models. The electric battery is stored under the seats which adds more weight to the car but gives it a lower centre of gravity. That, along with firmer suspension, helps to keep body roll in check. Even so, the stability control system still has a vice-like grip that prevents enthusiastic cornering. In that respect it’s no different to the rest of the range. Smart says the Forfour is 40kg heavier than the Renault Twingo, the model’s close relative, because it has extra sound-deadening material. Even so, you still hear quite a lot of the engine’s three-cylinder thrum, especially at high revs. There’s also noticeable wind noise from around the front pillars and doors at higher speeds, and you can hear the suspension thudding away beneath you on bumpy surfaces. In addition, the 1.0-litre engine needs to be revved quite hard to avoid stalling it off the line. This, plus the vague clutch and brake pedal feel, makes the Forfour tricky to drive smoothly around town. On the plus side, the five-speed manual gearbox does have a light and slick action. The Brabus version gets a sportier exhaust that does make it louder, but this is in keeping with the character of the car. The electric model is blissfully quiet around town. Out on faster roads road noise is quite noticeable, as well as a bit of wind noise. It’s not that it’s any worse than other models, you just focus on it far more as there’s no engine noise.